Dedicated to Mothers, ONE and ALL! America's mothers hold a special place in our hearts, providing the lessons and care that have enabled generations of children to embrace the opportunities of this great land. They embody the compassion, devotion, and energy that have always defined our national character, and their daily efforts anchor our country's commitment to the fundamental values of respect and tolerance. 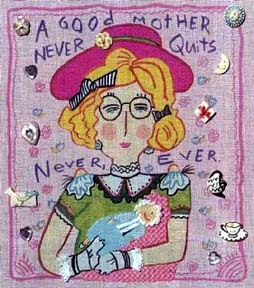 Mothers impart both the strength that enables us to face our challenges and the love that comforts and sustains us. As we honor our Nation's mothers for past and present accomplishments, we recognize that mothers' roles have changed significantly in recent years. Today, mothers are CEOs and teachers, physicians and nurses, elected officials and PTA presidents, police officers and volunteers, homemakers and heads of households. Many serve on the front lines of the struggle against violence and poverty. These women -- problem-solvers, caregivers, and teachers -- are using their talents in every sector of our society, helping all Americans to look forward with hope and faith in the future. This design employs the sheaf stitch, a wonderfully textured stitch, which is commonly used on both linen and canvas and which makes a great border stitch. 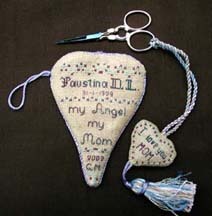 It is made of a bundle of parallel satin stitches with a single stitch that brings the stitches together in the center. The effect is rather like a sheaf of wheat standing out in the field! Using different fibres will give you quite different effects. 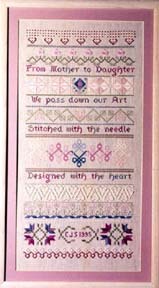 This stitch is also used in Thea's Heirloom Anniversary Sampler. Catherine Strickler's design, Mother to Daughter, is a beautiful piece, employing Caron Waterlilies Antique Rose and Harbor Mist threads. A Child's Prayer, by Linda Connors, was written especially for her Mother (who sadly passed away a year ago) when Linda was just a teenager. 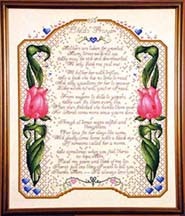 In 1993 she re-worked the poem as a cross stitch design to present to her mother for Mother's Day. Linda says, "Needless to say, there were tears all the way around. I hope other mothers get to enjoy it also." 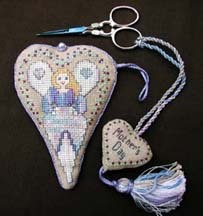 The design is stitched on 28-ct. tea-dyed Monaco and is embellished with several colors of Mill Hill frosted seed beads. 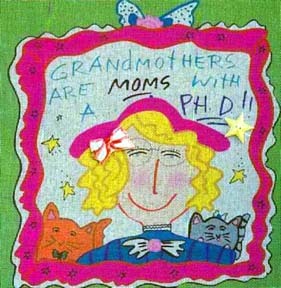 Grandmothers are Moms with a Ph.D. 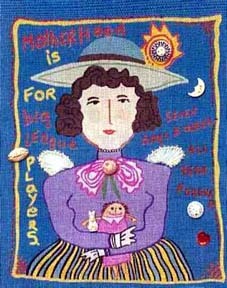 These needlepoint creations by Barbara Elmore focus on being a mother. They are adapted from cartoons by the fabulous graphic artist, The Real Nancy Drew, widely known for her whimsical, yet poignant messages relating to women and children. Bonnie Turner's designs, Nature's Bounty and A Gift of Love, are both appropriately dedicated to Mothers. 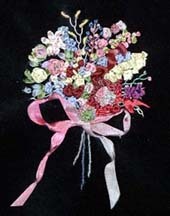 One depicts a lovely basket full of silk ribbon flowers and the other is a gorgeous bouquet of silk ribbon flowers. Both designs are embroidered on velvet. They form part of a series on velvet which will either be incorporated into a crazy quilt or framed. Bonnie chose flowers as her motif because, Bonnie admits, "I don't have a green thumb and don't like to get my hands dirty. So I don't garden as a result. These are my gardens & they never need to be weeded, watered & they don't die." Bonnie is a quilter who teaches many different aspects of quilting, silk ribbon art, flower pounding and crazy quilting. This beautiful handkerchief design, I Thee Wed by Ellen Johnson, is suitable for several occasions, including Mother's Day. Originally designed as a wedding project, it is appropriate for the mother of the bride, the mother of the groom, the bride (if she is a mom or mom-to-be) and even the bridesmaids, if they are moms. 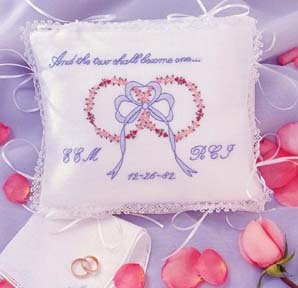 Also included in the leaflet is a design for a delicate bridal handkerchief. Only seven basic stitches are used to complete these keepsake treasures: backstitch, lazy daisy stitch, heirloom lazy daisy stitch, French knot, bullion stitch, stem stitch, and fly stitch. Mother's Day has long been a welcome opportunity to celebrate motherhood and to remember our mothers -- whether biological, foster, or adoptive. To reflect on all we have gained from our mothers' guidance and to remember their sacrifices, the Congress, by a joint resolution approved May 8, 1914 (38 Stat. 770), has designated the second Sunday in May each year as "Mother's Day" and requested the President to call for its appropriate observance. Now, Therefore, I, William J. Clinton, President of the United States of America, do hereby proclaim May 12, 1996, as Mother's Day. I urge all Americans to express their gratitude for the many contributions made by our mothers and to observe this day with appropriate ceremonies, activities, and programs. In Witness Whereof, I have hereunto set my hand this seventh day of May, in the year of our Lord nineteen hundred and ninety-six, and of the Independence of the United States of America the two hundred and twentieth. * Note: To date, there has been no more recent proclamation! 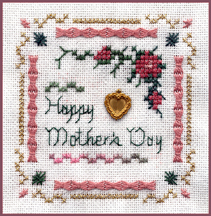 To purchase Thea Dueck's design, Happy Mother's Day, please visit the Victoria Sampler website and click on the Shop Finder link to find a needlework shop near you! If your favorite needlework shop does not carry their line, please have your shop contact them. 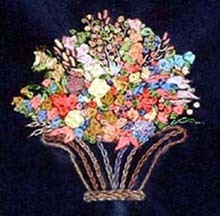 When visiting the website, sign up for your FREE membership in the Heirloom Embroidery Sewing Circle!